Given the typical choices available in markets, which vegetables should you eat to obtain the widest range of healthy vitamins, nutrients, and fiber? "My response is simple: eat all of the colors of the rainbow," says Dr. Michelle Hauser, a clinical fellow in medicine at Harvard Medical School and a certified chef and nutrition educator. "These colors signal the presence of diverse phytochemicals and phytonutrients." Phytochemicals and phytonutrients are beneficial substances produced by plants. People who eat diets rich in phytonutrients have lower rates of heart disease and cancer—the two leading causes of death in the United States. As an added bonus, vegetables provide fiber, which helps prevent constipation and helps keep cholesterol in check. Kale: Kale has dark green leaves, Dr. Hauser says, but many varieties have purple ribs (with green leaves), are completely purple, or are just very dark green. "Some of the very dark green varieties have a lot of the phytochemicals that produce purple hues," Dr. Hauser says. "It's just that the green pigments overpower the purple ones." Nutritional profile. One cup of kale provides all of your daily need for vitamin A, C, and K. Kale is also a good source of calcium and potassium. Calcium helps to preserve bone strength and potassium aids blood pressure control. Other vegetables in this group. A number of vegetables come in purple or blue varieties, such as eggplant, cauliflower, turnips, potatoes, cabbage, asparagus, and carrots. Swiss chard: Swiss chard is among the many green vegetables rich in the phyto-chemicals sulforaphane, isocyanate, and indoles. The ribs in chard are usually another bright color—like red, yellow, or even multiple colors—so you get the benefits of the phyto-nutrients associated with those colors as well. Nutritional profile. One cup of cooked Swiss chard provides all of your daily needs for vitamin A and K, and half of your daily vitamin C. It is also rich in magnesium and is a good source of iron, potassium, calcium, and fiber. Other vegetables in this group. Other vegetables that come in green varieties include broccoli, Brussels sprouts, cabbage, kale, bok choy, broccoli rabe (also known as rappini), salad greens, sprouts, and collard or turnip greens. Sweet Potatoes: Orange and yellow fruits and vegetables get their color from the antioxidants alpha- and beta-carotene. control if you have hypertension. Other vegetables in this group. Other vegetables that come in orange or yellow varieties include carrots, yellow and orange peppers, and many varieties of squash and pumpkins. 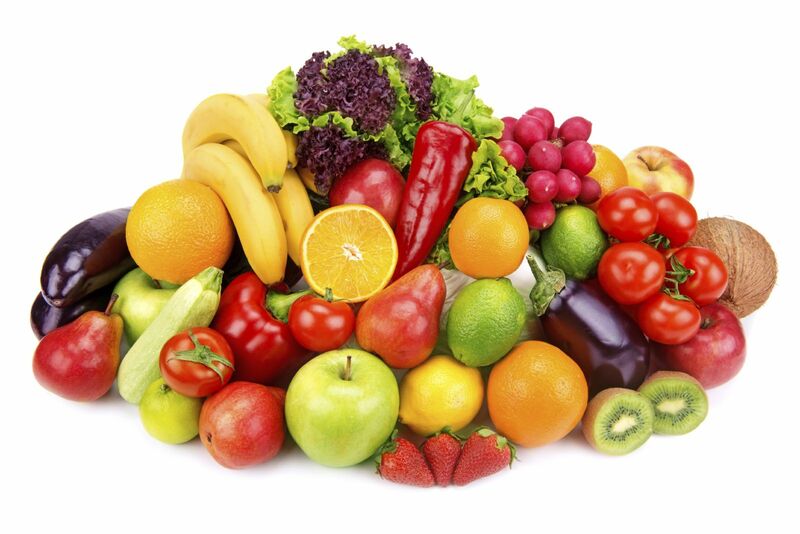 the pigment found in abundance in red, orange, and yellow fruits and vegetables. The science isn't clear yet whether the health benefits of tomatoes come mostly from lycopene or from their full range of vitamins, minerals, and other nutrients. Nutritional profile. One cup of cooked tomatoes provides nearly all of your daily vitamin C and 25% of your vitamin A. Tomatoes are a good source of potassium and iron. Other vegetables in this group. Other vegetables that come in red varieties include beets, red peppers, radishes, radicchio, red onions, and red lettuces. Parsnip: Parsnip, a root vegetable, is widely available and has a richer complement of nutrients than onions—the white/light green vegetable consumed in abundance in the American diet. White fruits and vegetables contain compounds called flavonoids, such as quercetin, kaempferol and anthoxanthins, which have a range of healthful properties. Nutritional profile. One cup of parsnips provides about a quarter of your daily fiber, vitamin C, and vitamin K. They also deliver potassium, magnesium, and vitamin E and B, as well as calcium and other minerals. Other vegetables in this group. Other vegetables that come in white varieties include garlic, onions, leeks, -celery, -asparagus, kohlrabi, radishes, Napa cabbage, squash, fennel, and turnips. Transform your eating habits into a program of nutritious and delicious food choices that can last a lifetime. Buy the Harvard Special Health Report The Harvard Medical School 6-Week Plan for Healthy Eating.